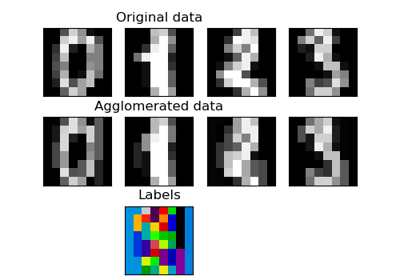 Similar to AgglomerativeClustering, but recursively merges features instead of samples. The number of clusters to find. Metric used to compute the linkage. Can be “euclidean”, “l1”, “l2”, “manhattan”, “cosine”, or ‘precomputed’. If linkage is “ward”, only “euclidean” is accepted. Connectivity matrix. Defines for each feature the neighboring features following a given structure of the data. This can be a connectivity matrix itself or a callable that transforms the data into a connectivity matrix, such as derived from kneighbors_graph. Default is None, i.e, the hierarchical clustering algorithm is unstructured. Stop early the construction of the tree at n_clusters. 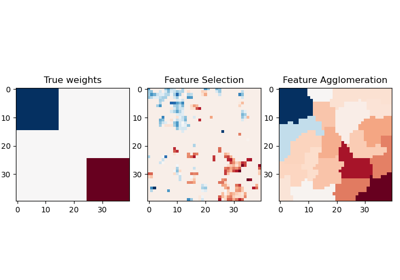 This is useful to decrease computation time if the number of clusters is not small compared to the number of features. This option is useful only when specifying a connectivity matrix. Note also that when varying the number of clusters and using caching, it may be advantageous to compute the full tree. Which linkage criterion to use. The linkage criterion determines which distance to use between sets of features. The algorithm will merge the pairs of cluster that minimize this criterion. ward minimizes the variance of the clusters being merged. average uses the average of the distances of each feature of the two sets. complete or maximum linkage uses the maximum distances between all features of the two sets. single uses the minimum of the distances between all observations of the two sets. This combines the values of agglomerated features into a single value, and should accept an array of shape [M, N] and the keyword argument axis=1 , and reduce it to an array of size [M]. cluster labels for each feature. Number of leaves in the hierarchical tree. The estimated number of connected components in the graph. pooling_func(a[, axis, dtype, out, keepdims]) Compute the arithmetic mean along the specified axis. A vector of size n_samples with the values of Xred assigned to each of the cluster of samples. Compute the arithmetic mean along the specified axis. Returns the average of the array elements. The average is taken over the flattened array by default, otherwise over the specified axis. float64 intermediate and return values are used for integer inputs. Axis or axes along which the means are computed. The default is to compute the mean of the flattened array. Type to use in computing the mean. For integer inputs, the default is float64 ; for floating point inputs, it is the same as the input dtype. If the default value is passed, then keepdims will not be passed through to the mean method of sub-classes of ndarray , however any non-default value will be. If the sub-class’ method does not implement keepdims any exceptions will be raised. If out=None , returns a new array containing the mean values, otherwise a reference to the output array is returned. The arithmetic mean is the sum of the elements along the axis divided by the number of elements. Note that for floating-point input, the mean is computed using the same precision the input has. Depending on the input data, this can cause the results to be inaccurate, especially for float32 (see example below). Specifying a higher-precision accumulator using the dtype keyword can alleviate this issue. By default, float16 results are computed using float32 intermediates for extra precision. A M by N array of M observations in N dimensions or a length M array of M one-dimensional observations. The pooled values for each feature cluster.